MinHost Review 2019: Is MinHost a Good Hosting? Norway-based vendor, MinHost, offers one shared hosting plan with enough features for many medium to large online business needs. The plan is low-cost, however, it only supports PHP and doesn’t offer a website builder or one-click installer. For over a decade, MinHost has been offering shared web hosting to its customers from Norway. It uses servers in three data centers in Germany, Netherlands, and Norway respectively, but it serves customers who can provide a valid Norwegian postal address only. It offers one shared hosting plan and domain registration services. The support is in Norwegian only. MinHost doesn’t have an official uptime guarantee, which is strange amongst web hosts. Nevertheless, it provides up-to-date fast servers. The servers are replaced every four years to keep downtimes at the lowest possible. It uses SSD in raid 10 to provide speed. Also, its dual octa-cores and dual hexa-cores ensure that it can complete many instructions at the same time. For me, the lack of a one-click installer and website builder is a downside. They are particularly important, especially now that users of web hosting are not only experts who can write code and use FTP. It’s clear that the service is not for beginners. Experienced PHP users, on the other hand, will enjoy it as standard features like phpMyAdmin, shell access, and cron jobs are available. The databases are MariaDB, and there’s DNS control as well, all of which is managed from the DirectAdmin control panel. You might have noticed that I didn’t mention any other programming language. If you use Python or most things outside PHP, you may have to look elsewhere, as unfortunately, they are not supported. As mentioned above, MinHost offers only one plan, giving users no selection. Nevertheless, that one plan offers plenty of space, traffic, email accounts, and FTP accounts. As a result, small business websites and personal websites might have to look elsewhere, as the resources may be too much for them. No personal website needs up to 100 email accounts, and 1.5TB monthly traffic will be too much for a small business website. That said, the hosting is very low-cost. You’ll rarely see such a pocket-friendly price for this level of SSD and traffic, though only annual subscriptions are available, and there’s no money-back guarantee or refund. Customers can reach MinHost’s customer support between 8:30 a.m. to 5:30 p.m. GMT +1 by telephone or by logging in to the customer center to send a message. There’s no live chat or email address displayed. I contacted them but only received a response days after. Also, you’ll have to rely on customer support or search engines when you need help because there’s no knowledge base on the website either. If you’re looking for a web hosting vendor in Norway, MinHost might be for you. It has fast performance servers with a good maintenance culture, and the hosting plan offers high resources. Based on the large amount of resources and lack of relevant tools, this vendor seems more suitable to experienced technical professionals, as opposed to beginners. 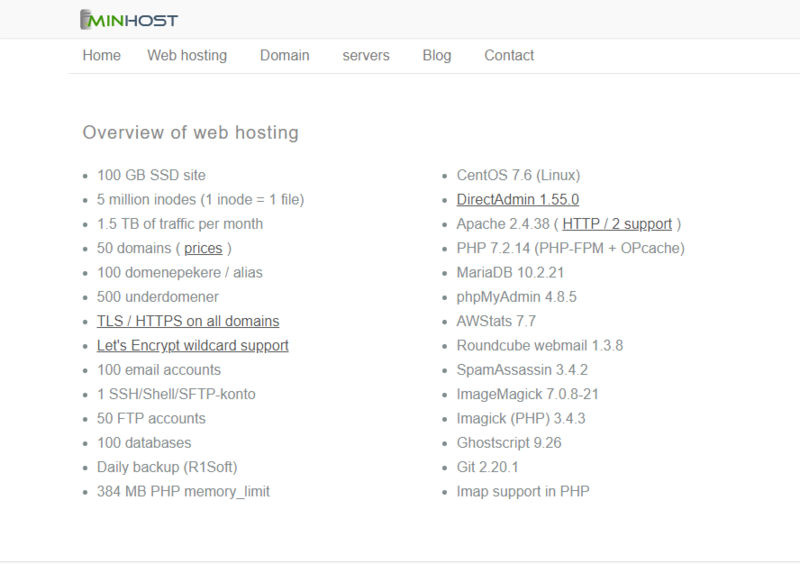 Wondering how MinHost stacks up against other Web Hosting companies? Enter any other Web Hosting company and we will give you a side-by-side comparison.